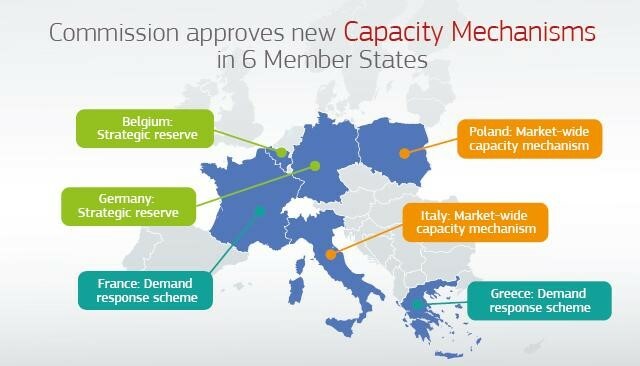 The European Commission, DG Competition, approved, on the 7th February, Poland’s plan to introduce a capacity market. This tool is a mean to guarantee sufficient generation capacity for the coming decade. Polish capacity market (CM) is the most cost-effective solution. It is estimated that until 2030, CM reduces the costs for Polish consumers by € 7 billion in total and wholesale electricity prices will be on average ca. EUR 5 /MWh lower by 2040. It will also lower the cost of capital for the new investments, specifically for peak-load capacity. The EC confirmed that the introduction of the CM, for a period of ten years, is a response for the clearly identified security of supply concerns. It is estimted that until 2030, 10-30% of the existing conventional capacity will be withdrawn from the market due to the age and non-compliance with Best Available Techniques (BAT) standards. The Polish market-wide capacity mechanism is technologically neutral. It is open to all types of capacity providers, including renewables, demand-response as well as foreign entities. Furthermore, the measures will keep costs for consumers in check thanks to the regular, competitive auctions to allocate capacity contracts. While CM is a key measure to guarantee the security of electricity supply, it will also help to modernise Polish electricity generation portfolio.